Initially, we were responsible for a lot of the daily work—the tactical side of things. As Provision has grown, we’ve stepped away from some of the daily work and focused more on the vision at times. We focus on setting the direction and the goals for our growth. Stepping away from the day to day doesn’t always work exactly like we plan, however — my voicemail has overflowed, and I sometimes get hundreds of texts a day — but as we move forward, managing it all is absolutely key. Good people are one of our most important resources, and when we find good people, we do everything we can to treat them right. Here are some lessons I’ve learned about building a great team. You can tell when you first meet somebody what you’re dealing with. Sometimes you might fall in love with a particular skillset that someone brings to the table, while letting it distract you a bit, from what you know deep down. Listen to your gut. Ignore it at your own risk. You might bring someone on as either an investor or a team member that can hinder your company rather than propel it forward. Financial compensation isn’t the only thing that matters, but it is important. We make sure our people are well compensated, especially when we find someone who we really want to keep around. Insurance and retirement are the benefits everyone talks about, but we’ve started trying to incorporate some intangible benefits as well. For example, I’m starting a class for staff on financial management that will help teach them about markets and investing. Aaron and I have cut our teeth on some expensive mistakes, and if there’s knowledge we can pass on, we want to do that. Strategy and vision are important, but there’s no substitute for your employees seeing that you’re willing to roll up your sleeves and get your hands dirty. Aaron and I are big on standards. The moment we relax our standards, it shows in the staff’s performance and the guest experience. If you’re not on point, the guest will let you know. If I walk into a restaurant and there’s a problem, I’m the first person rolling up my sleeves and getting in. You have to hold up the standard yourself. No one wants to work for a group that’s like lackadaisical on performance. When it’s game time, you have to bring it. If people really want to leave, we’ll support them as best we can. Too many companies cut you loose if you put in a notice, and sometimes it’s for good reason. If we can’t provide something for a solid employee however, we’ll applaud you to the next step. Even right now, there’s a guy working for us who wants to start his own restaurant. I’ve told him multiple times, “Hey, when you want to go out and do your own thing, I’ll advise and help the best way I can.” Your people have to know you care. Your people are one of the most important resources you have, and as you grow, you’ll have to hand off more to your team. We’re seeing it now with our staff. 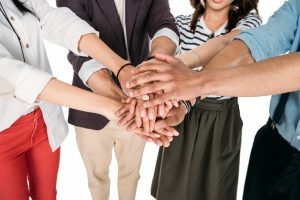 Make sure you do what you can to build a great team and you’ll reap the benefits in productivity, customer service, reputation and more.